Please! Just a few bites of filet mignon! A 3-pound bag of dog food could easily supply a Chihuahua for four months. The petite canines just don't go through kibble as quickly as their larger canine counterparts do. Not every Chi is the same, though, and even two from the same litter can have different appetites. 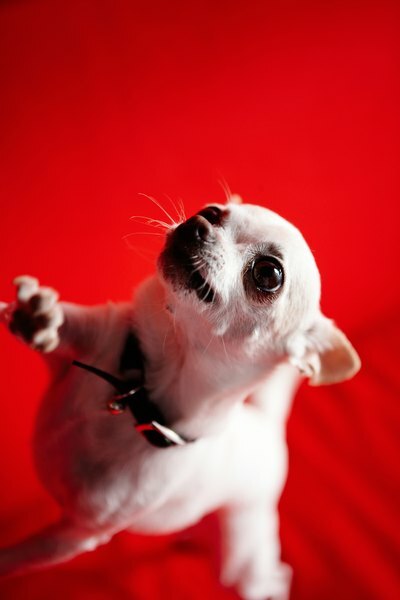 Your Chihuahua has her own personality and her own way of doing things, and that extends to her appetite. Just like some humans are finicky eaters, sometimes Chihuahuas are so selective about what and when they eat, it can drive you mad. Yet, there is the other side of the coin: many Chi's have such healthy appetites that their parents have to count calories and carefully portion out their food. Quality dog food manufacturers recommend that toy breeds like your Chihuahua be fed 1/2 to 3/4 cup of kibble each day for good nutrition. Depending on which side of the fence your Chi is on, it could either be a struggle to convince her that amount is enough or that it isn't too much. Some Chihuahuas will eat anything, anytime and anywhere. This can be viewed as both a blessing and a curse. If your Chi is one of the easy-to-please types she could easily become overweight. You'll have to measure out her food and keep a close eye on the snacks, too. You shouldn't free-feed your petite pup as she could be inclined to eat too much in one sitting. Instead, divide her daily ration of kibble into three portions and feed her when you eat breakfast, lunch and dinner. This will satisfy her appetite and keep her from overindulging; and because she'll be busy with her meal, she'll be less likely to beg for a treat from your plate. Picky eaters can be more difficult to deal with in some ways than Chihuahuas with hearty appetites. Nothing seems to appeal to them, and even when you find a food they seem to like, odds are they'll lose their taste for it before they've eaten the supply you bought. Getting your fussy Chi to eat is vital to her health as a Chihuahua who doesn't maintain her blood sugar levels can become hypoglycemic. Try mixing baby food with kibble to entice your reluctant pup to eat or mix canned food with kibble to make it more appetizing. Cooked chicken breast is another option that picky Chihuahuas will sometimes eat willingly. Offer it alone or mixed in with food to encourage your pooch to partake. No one knows your Chihuahua's habits better than you. When you notice a change in Chico's appetite you should notify your vet. A dog who was previously unwilling to eat and is suddenly ravenous is as much a cause for concern as one who typically plans her day around mealtimes but abruptly stops eating. Changes in appetite shouldn't be ignored, as they are a sign of illness. Always consult an experienced veterinarian regarding the health and treatment of your Chihuahua, particularly when eating habits are involved. What Is a Powder Puff Dog?